Lauren and Shawn wait in the library for the afternoon bus. Spending her time efficiently, Lauren catches up on homework. Shawn, though, kills time flipping through the local newspaper. Turning the paper open, Shawn slaps his hands on the table. “Lauren, here’s a picture of our ranch. The rangelands, anyway, at Baking Powder Springs. Look, this article it’s called, ‘Local Ancient Rock Graffiti'”. The two teens ask the local librarian for books about the history and facts of the ancient rock graffiti, then they are sent to the local museum to discover there are no answers. The books that the two read about ancient rock art across western Wyoming are interesting, but extremely vague because there is little research published. 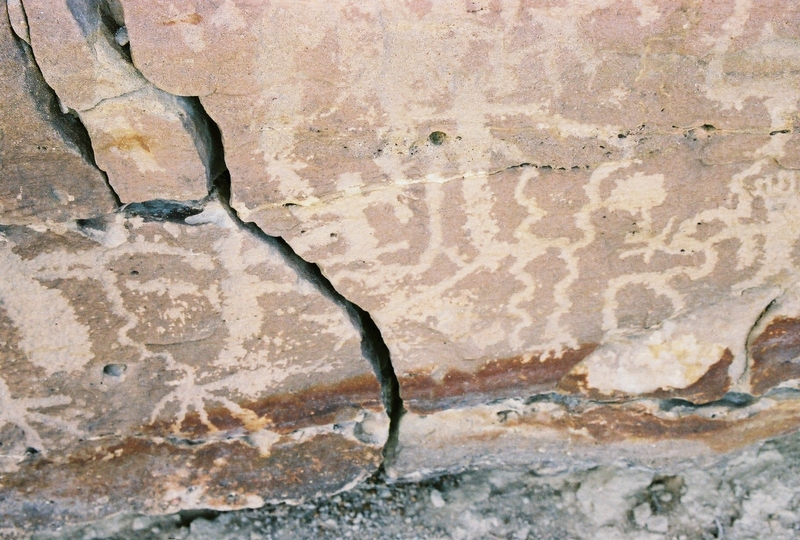 New technologies, though, promise breakthroughs and answers about the petroglyphs. The scratches and scrapings intrigue the teens and becomes a mystery. A mystery so sacred that even the grownups around cannot answer. The Native myths and legends read fuel their curiosity even more. “That says it all,” Shawn closes the book. “Well, I guess I do,” Shawn shrugs and drops his hands to his sides. “I have lot’s of homework this weekend,” he smiles as he puts the research books away. “You’ve got all weekend,” Lauren encourages her brother’s notion to ignore his school work. “Come on, let’s get home and tell Dad what we’re doing. Maybe, he’ll know where the pictures are.” Lauren says racing for the bus. Shawn and Lauren set off early the next day riding horseback for miles in unbroken silence through Wilson Draw to make their own discoveries. The gentle autumn breeze bending the dry grass and the steady clap of their horses’ hooves upon the pebble trail echo through the canyon walls. Juniper trees fill every draw with their sweet musky smell. Shawn points over his shoulder to a scrawny coyote trailing at a distance behind Lauren. He pulls his rifle from the scabbard. Lauren wiggles in her saddle before urging her horse to a gentle trot, “Don’t shoot!” A startling racket bursts from the tall sagebrush. One lone Magpie erupts in a frenzy of black and white, clucks and caws, sending Shawn’s white and copper horse from his sleepy walk into a saddle-slapping, nostril-flaring, tail-farting launch that only horses are good at. Lauren laughs at her brother’s near loss of his seat from the secure old ‘Hamley’ saddle. The sun, high in the October sky, drums down steady heat. 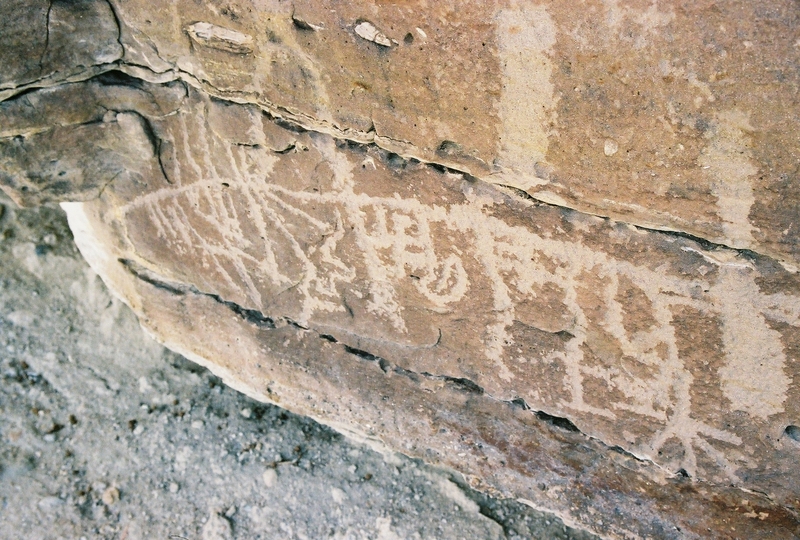 The two riders near the petroglyph site of Baking Powder Spring and its surrounding pale cliff walls edged with shags of coarse brush and cactus. Minutes later, two cans of baked beans and wieners are roasting over a fire built from cedar and dry boughs. The cool autumn evening creeps in. “We’d better go look around while we have some daylight left,” Lauren pops the last of her charred ration in her mouth. “No, there aren’t. There are some in Hot Springs County, though, I read.” Lauren scratches her nose before explaining. “Solutions of sands, dyes and animal fats were sprayed from their mouth over their hand leaving a perfect stencil,” she talks with her hands and spraying an imaginary mist from her lips. They reach the stone wall. “Finally! Here they are, and lower than I imagined. I thought they’d come to about my shoulder,” Lauren says. “So these petroglyphs are 5,000 years old?” Shawn asks. “Maybe, remember there is no carbon dating. The pictures are above the soil; no dead organisms to study,” Lauren reminds Shawn of their research. “That book of Mom’s will be handy. We’ll look at it later,” Shawn says as he scans the ridge-tops to the North. “Now, back to this ‘Hunting Magic’. Do you think these drawings are a map?” Shawn’s eyes flicker with excitement. “Wow!” Lauren says with a yawn and tucks her book under her bed-role. “Good night Shawn. Sweet dreams!” Lauren is asleep before the first stars come out, leaving Shawn alone listening for tapping and scraping on the nearby rock.